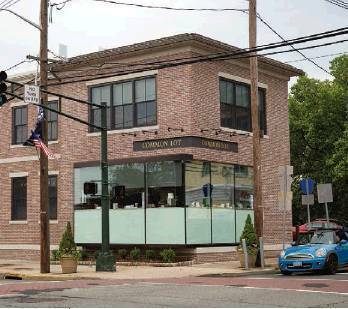 It seemed as if everyone was waiting breathlessly for Common Lot to open during the long months that the restaurant took shape at the corner of Main and Essex streets in Millburn. The work on the brick-sided building with the big glass windows originally was scheduled to be finished in December, but you know how that goes. Finally, following a soft opening in March, the restaurant proved its buzz-worthiness by booking up fast. The space has a studied casual flair, the perfect setting for “globally inspired modern American” food that is thought-provoking. Often so pretty they seem suitable for framing, each dish demands appreciation before one digs into such colorful compilations as delicately handled roasted heirloom carrots ($10) artfully balanced against each other with a backdrop of honey, cumin, pumpkin seeds and yogurt, or lissome butter-poached halibut ($32) flattered by a morel cream sauce. “Interesting” ingredients — for example, the soy caramel in the $75 braised lamb for two or pickled kohlrabi and crispy garlic with the salmon sashimi ($18) — are an attraction. “We took a risk and it’s paying off. I think people like the change,” said chef/owner Ehren Ryan, a native of Australia and veteran of cooking everywhere from India and the Philippines to the Channel Islands and England. He works with his wife, Nadine, who comes from Austria. An expert on cheese and tea who studied hotel management, she runs the front of the house, supervising expertly trained, well-informed staffers. They embody the right degree of solicitousness to make the smooth-flowing evening a pleasure. Although Ryan patronizes a farmers’ market in town, he isn’t wedded to strictly local ingredients, instead preferring to obtain what he needs for his seasonal menus at whatever purveyor offers the best quality of the items he seeks. Great care has been taken with the furnishings, featuring hand-forged metal to go with reclaimed factory wood boards. An upstairs dining area featuring a cookbook collection accommodates 28. The layout in the downstairs dining room that seats 34 is interesting, with a community table in the center, a banquette along one wall and very comfortable semi-circular booths on either side near the entrance at the lower level. Space for four at a counter looking into the open kitchen comprises the “kitchen pass” area, where spots go for $95. The concept offers a chance to interact with the chef and explore a multi-course menu that is billed as a surprise. Bread isn’t served, so we went with the highly touted bag of egg and crisps ($5) to get our meal under way. The house-made potato chips are shaken in a bag to mix with a soft 64-degree egg. Sorry, but it left me cold, and was rather messy to eat. Every dish shows thought. Sirloin ($32) dry-aged in-house gets its mojo from a Reform sauce featuring bits of beef tongue. Sweet little smooches of house-made gnocchi combine with a duck leg ragu ($29), shiitake mushrooms and Pecorino. Vegetarians are not forgotten. Roasted cauliflower ($22) and cauliflower puree (with purple cauliflower for color) are lifted with a relish of sultana raisins and capers. Desserts by Alexa Clark (formerly of Local Seasonal Kitchen in Ramsey) are fascinating. You can’t go wrong with the Pavlova, the incredible lightness of meringue ($10) matched with the slick velvet of citrus mascarpone and a dusting of dark chocolate. For the kid in you, there’s the chocolate mousse/peanut butter mousse combo ($10) elevated by dulce de leche and cocoa nibs. Plum brandy sorbet gives a tingle to vanilla rice pudding ($10). The pudding is served in a covered dish, with the sorbet on the lid so it stays cold. Just lift the lid, put it on the side, and partake of both components. 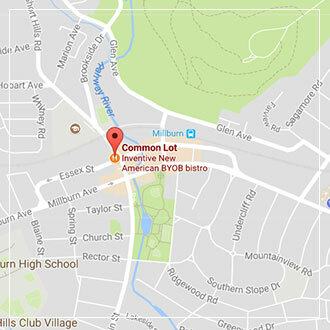 About the restaurant’s name: you know what “common” means. Think one step ahead to communal, and “lot” in this instance stands for a crowd of people, as well as plentiful and abundance. Common Lot is about a place to meet and share unusual food, an experience with an ambiance on the table and in the room that makes for a unique evening. 27 Main St., Millburn. 973-467-0494. commonlot.com. Hours: 5-10 p.m. Tuesdays-Thursdays, 5-10:30 p.m. Fridays-Saturdays. Closed Sundays-Mondays. BYOW. ★★★½ (three and one-half stars) out of 4!